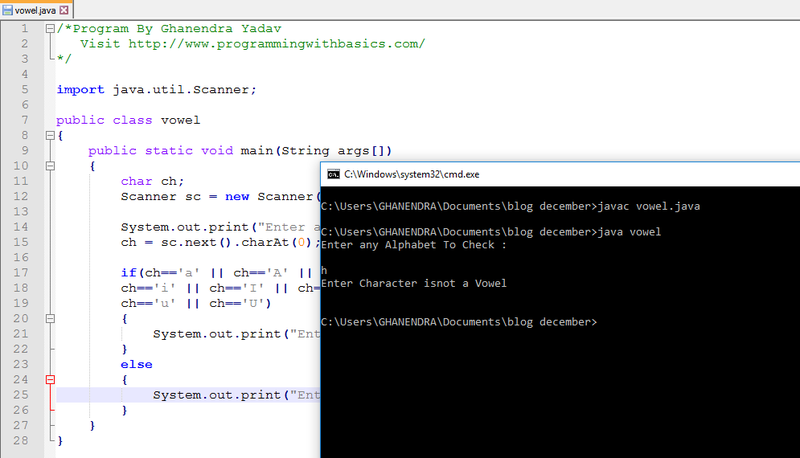 Program:- Java Program to Check Vowel or Not or Java Program to Check Character Is Vowel or Not or Java Program To Check Vowel Or Consonant or java program for Vowel Or Consonant or Java Program to Check Whether an Alphabet is Vowel or Consonant or Java Program to Check a Character is Vowel or Consonant or Java Example Program for given character vowel or not or Java Program to Check if a Given Character is Vowel or Consonant or Check If String Is Vowel Or Consonant or Take a character input from keyboard and check it is it alphabet with vowel or alphabet with consonant. Logic:- We know in the English Language there are only 5 Vowel's and rest (21) are consonants. Vowels are in capitals A, E, I, O, U or vowels are in small alphabet a, e, i, o, u And Consonants are in capitals is B, C, D, F, G, H, J, K, L, M, N, P, Q, R, S, T, V, W, X, Y, Z or Consonants are in small alphabet is b, c, d ,f, g, h, j, k, l, m, n, p, q, r, s, t, v, w, x, y, z So now we have to just check and match that character to given vowels and consonants if the entered character matched with vowels then program will print character is vowel or if entered character is matched with consonants then program print character is Consonants.